As you may have seen in an earlier post, Disney’s Grand Californian Hotel & Spa at the Disneyland Resort is currently undergoing an exciting hotel-wide renovation. As the first phase of hotel rooms are completed and guests are starting to experience some of the new magic, we thought it was the perfect opportunity to share the details found in our newly reimagined guest rooms. 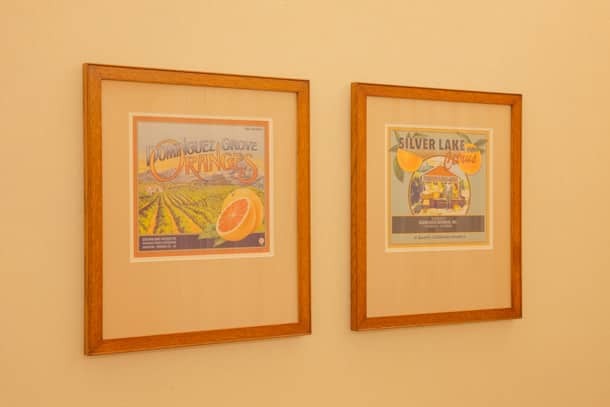 California-inspired artwork dot the room walls, including original designs of orange crate labels paying homage to Disney history. For example, Dominguez Grove Oranges is named for the family of Ron Dominguez, the owners of the property that Disneyland would be built on. Also, Silver Lake Brand Citrus is named for the Los Angeles neighborhood that was home to Walt Disney’s Hyperion Street Animation Studio. 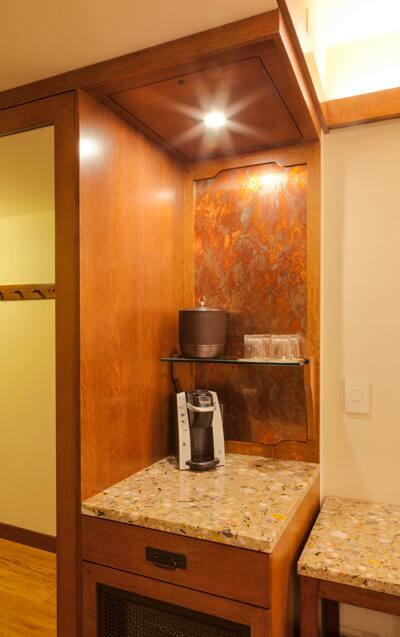 Countertops of the room’s desk, dresser and coffee station incorporate pieces of green glass from wine bottles, creating a beautiful, unique surface. Above the coffee bar, textured copper detailing adds depth to the aesthetic of the room while enforcing the Craftsman story. Copper was one of the most common metals used during early Arts and Crafts designs, especially in Pasadena homes by Greene and Greene. Lastly, all rooms are powered with the latest technological features and premium amenities, including 55-inch smart TVs, Keurig coffee makers and built-in USB chargers. When is your next visit to Disney’s Grand Californian Hotel & Spa? The rooms look very nice with the updates. The only thing I would change are the lights on the bed posts. They look more like a style used in Victorian architecture. I like the mini wet bar and hope the refrigerators in the new rooms work better than the previous ones did. We stayed in one of the new rooms for Dapper Day. They are beautiful. I was worried that they would too modern but the decor is in keeping with theme. My only complaint is that they got rid of the bath tubs. Being able to soak my back and feet after a day at the park made a big difference in my ability to get to sleep and keep going on subsequent days. We will be there May 31st for my 50th birthday. I hope we get one of the new rooms! It will be our first time staying and I’m really excited!! Can’t wait to be there starting May 21st for my son’s 21st birthday!! We are so looking forward to being at the Grand once again! Have all the rooms been refurbished now? I’m so glad Disney refreshed the GC rooms without drifting away from it’s glorious theming. I was so scared they would be “too modern” looking, but they are gorgeous. Well done! We will be there next week! Would love to be in a refurbished room! See you soon! We will be there next month, we are looking forward to the renovations. We last stayed there in 2005, the contrast between the two styles should be interesting. °?° up the ears! Already booked for Mickey’s Halloween Party and Gay Days in October! This looks really pretty and bright. Well done! Will there still be a room option with bunk beds? My kids were looking forward to that in September. Stayed there a year ago and loved it as it was. Like that the new rooms look much brighter, however. We were there 3 weeks ago & our room was nice, even though it wasn’t refurbished yet. However, this new design looks beautiful too. You have very creative & talented decorators! Stayed in a refurbed room last month. One of the nicest features for us was the raised bed. There is enough room to store luggage under the bed. The rooms are the same size as before. Look for the Hidden Mickey’s and even Hidden Chip and Dale’s in the rooms plus in the hallway carpet. Nice touch! My daughter is obsessed with finding them. How large were the rooms prior to the remodel (square footage) versus how much square feet are in the rooms after the remodel? I ask because they look a tad smaller. 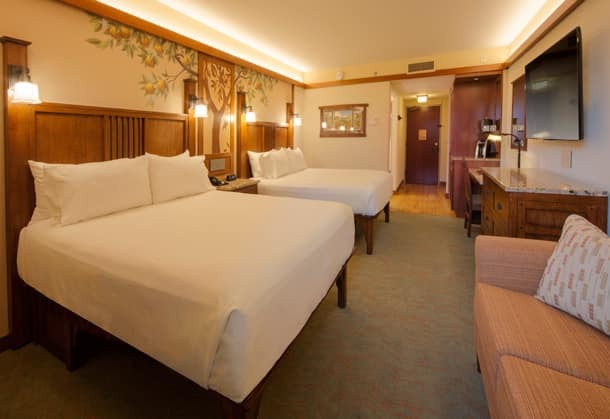 With the refurb does that mean staying at the Grand Californian will be even more expensive? I love that it’s elegant but Chip n’ Dale are among the branches – very fun! Michael they look beautiful! We weren’t sure a refurb was necessary but seeing this makes us very confidant it was time for something new. Thanks for sharing. 2 weeks!!! Our 1st stay at the Grand Californian…Usually Disneyland Hotel groupies. Lovely. Are the 1, 2, and 3 bedroom suites the same floor plans? Any photos of those rooms? Planning our next visit, no date set yet. I’ll be staying there starting July 4, through Disney vacation club. Will the two bedroom suites be finished by then? When is the pool scheduled to be finished? We will be there in September for the half marathon! 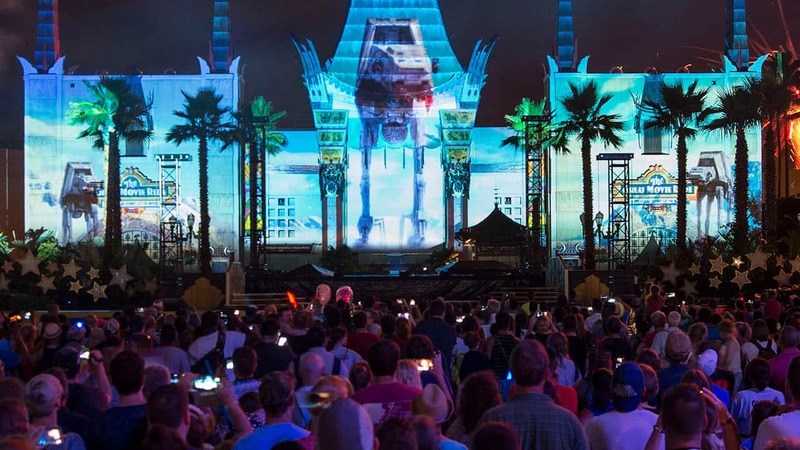 Moms Panel Monday: Planning a Trip to Disneyland Resort?